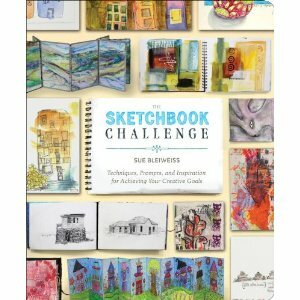 Twisted Sister: The Sketchbook Challenge - BOOK! The Sketchbook Challenge - BOOK! by Sue Bleiweiss, the creator of TSC, and including the works of Jill Berry, Jackie Bowcutt, Laura Cater-Woods, Violette Clark, Jane Davies, Jamie Fingal, Judi Hurwitt, Tracie Lyn Huskamp, Susan Brubaker Knapp, Lynn Krawczyk, Leslie Tucker Jenison, Lyric Kinard, Jane LaFazio, Kim Rae Nugent, Kelli Perkins, Carol Sloan, Carla Sonheim, Kathy Sperino, Diana Trout, and Kathyanne White. My artwork is on the bottom center of the book cover. I can't wait to hold the book in my hands! This is so exciting! The book has a publication date of June of 2012 (hopefully it will come out a little sooner than that) but you can pre-order it on Amazon here. Fantastic Jamie! Love your house piece on the cover!